Blackboard is a web-based course management software used by instructors to build and manage their online classes. 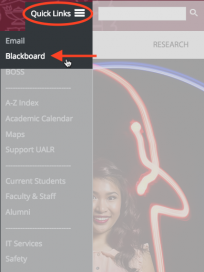 Blackboard can be accessed by logging into the myUALR portal. Your NetID is an authentication ID that you will use to access Blackboard through the myUALR portal. Additionally, you will use this ID to access the on campus wireless network from your personal laptop. You will use BOSS to manage your NetID and its corresponding password. If you have problems logging in to Blackboard that cannot be resolved by resetting your NetID password, please contact the IT Services at 501.916.3011. Login to BOSS with your T-Number. Select the Click Here to Continue link at the bottom of the Important Dates. Select List Accounts and Change Passwords from the list. Locate your NetID in the table of usernames. If you do not know your NetID Password, you can change it yourself in BOSS. Make sure your password is memorable but also at least eight (8) characters, with at least one alphabetic character AND one numeric or punctuation character. Look up your NetID in Boss. Select the check box in the Change Password column of the username table. Enter your new password in the New Password field, making sure to conform to the password character requirements. Confirm the password by retyping it into the Confirm field. Do not copy and paste. Click the Change Password on Selected Systems button. This will take you to a page notifying you that you request has been submitted and is being processed. Note: Password changes are typically instantaneous, but there could be delays. It should not take more than an hour for a normal password request to be processed. If you have any problems logging in to Blackboard that cannot be resolved by resetting the NetID password in BOSS, please contact the IT Services Help Desk at 501.916.3011. Please be prepared to supply your NetID.